In this lesson we are going to look at how we can apply what we learned in the section on Diatonic harmony using arpeggios. For this lesson we will be looking at the key of D major. 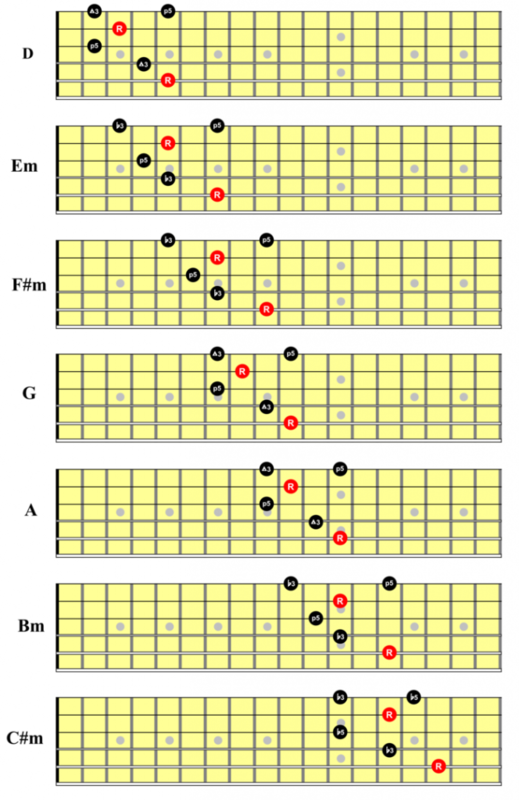 If he look at the harmonization of this scale the triad chords are. we will now play each chord as a arpeggio with the root starting on the A string. Practice moving smoothly between each arpeggio ascending and descending. Next use the backing track provided to practice using the arpeggios over the chord progression. Listen the the tonal changes as you play each arpeggio. We can use these arpeggios to play melodic solos when playing over a song that is in the key of D Major.